Newly Renovated, The Graham Sport is just 1 block from the beach and inland waterway. A 3 minute walk takes you to Sunset Beach's fishing pier and Causeway beach shops. If you prefer a more relaxful evening, enjoy our 50' flat screen HD television, or relax on the covered porch in our oversized rocking chairs. A few steps takes you to the top of the rooftop balcony where you can see the ocean or boats passing on the inland waterway. 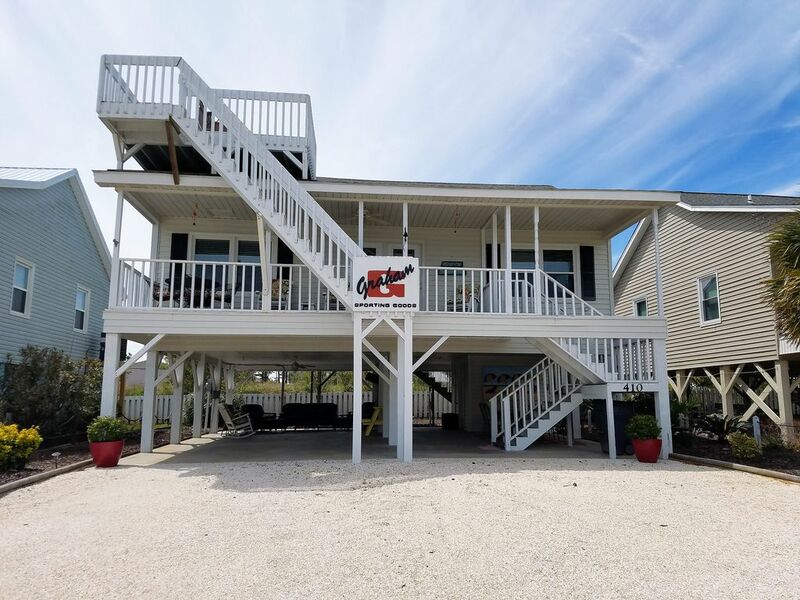 This clean, bright, newly updated home is 3-4 miles from renowned seafood dining in Calabash, or a 30 minute drive takes you to entertaining Myrtle Beach. Historic Wilmington is a short 45 minute drive where you can enjoy waterfront dining, antique shopping and a musical nightlife. Voted BEST BEACH IN NC by Duke University, Sunset Beach has something to offer every member of the family. Make memories for your family at The Graham Sport... the perfect location for the perfect vacation. Our family of three boys is fortunate to enjoy The Graham Sport every chance we get. Living in Greensboro, NC, the short 3.5 hour drive allows us to take advantage of every season since the weather is inviting throughout the year. Comfortable and eye pleasing, The Graham Sport allows us to forget our busy professional world and escape to a clean, family-friendly beach that offers something for every member of our family. We know your family will enjoy it as much as ours. Sunset Beach is perfectly located between energetic Myrtle Beach, SC and historic Wilmington and Southport, NC. Culture and entertainment are just minutes away. Lovely home close to the beach. Thank you Dean and Susan for sharing your lovely home. We can't wait to come back next year. We appreciate your help and speedy responses to our questions. Your home was the perfect October weekend getaway with our friends. walk to the ice cream shops, 5 minutes to the beach. A nice quiet, residential street. WiFi worked great which kept our kids happy. Loved the front porch and ground level outdoor seating with fans. We found everything we needed inside. Everyone slept well and found their beds comfortable. An oversized washer and dryer were a bonus. One level living was easy and convenient. Friendly owners. Lovely house with everything you could possibly need! Clean and comfortable! Attentive owners. We had such a great week! Our family truly enjoyed our stay at Graham Sporting Goods beach house! We loved the location! You could walk to the beach in no time! Loved the porches AND the swing and patio furniture under the main house! This was our 1st time staying at Sunset Beach and we'll be back! Love that the beach has not been commercialized! Just a short drive to restaurants and other stores! Enjoyed our time at Sunset Beach. Great Location. Will be back! Sunset Beach, NC is conveniently located 45 minutes north to historic Wilmington, NC and 45 minutes south to entertaining Myrtle Beach, SC.